Our contribution to Demodays 2012, on SuperGrafx. 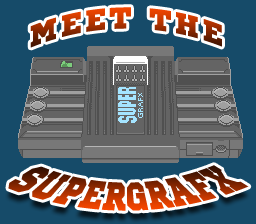 Nice overview of the SuperGrafx. I like the music. The twisters near the end were kinda crappy. Overall: thumbup. Plus perfect ammount of scene jokes ;). Nice one and platform thumb! "No progressive transparency" - hehe. I assume the twisters at the end were added to spawn a "hey, we can do that better!" race. rulez added on the 2012-09-03 13:47:38 by JAC! Cool One! Kudos for the platform. I like the demo and the platform! or is it just namevoting? rulez added on the 2012-09-03 18:21:57 by ɧ4ɾɗվ. Quite ok, but now that you know that you can use the machine, perhaps it's time to make something good with it ? well crafted demo. congrats for the platform. Motivation-Thumb for more stuff on this rare plattform! Nice introduction of the platform! Like the demo and the platform. Nice! Back that console was so powerfull, more or less just behind the crazy expansive neo geo, but few games designed for it. First half was pretty damn cool. The second half felt a bit out of place to me. Still pretty damn cool overall. Nice! Looks like a great platform indeed. Damn, too short and very far to show what the hardware is capable . if i find the time,i'll do something (other than games) on the SGX to show what you can do,and in Hi-Res (512x240) . But time, always time who's lacking . page created in 0.020855 seconds with 15 queries.